As a child and later in my teens, I rode a bike everywhere. That was my means of getting around - unless I wanted to walk. Even though I was never a "good" bike rider, I opted to ride rather than walking. However, I have never ridden a tandem bike. Have you? 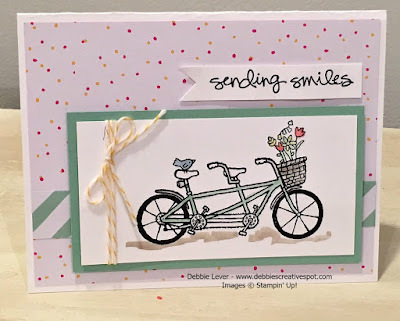 This card uses the new Pedal Pusher stamp set from Stampin' Up! which happens to be a Free! Sale - A - Bration pick with a qualifying order. Isn't this bike adorable! The card base is a piece of Thick Whisper White cardstock cut 5-1/2" x 11" and scored at 4-1/4". I find scoring this thick cardstock helps to avoid crinkles on the edge when folding. 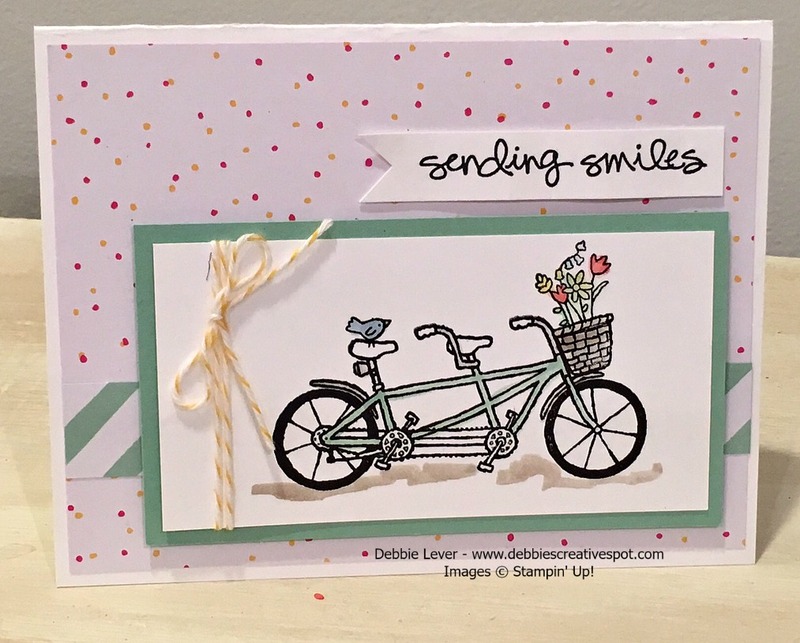 Next layer is a piece of designer paper from the It's My Party Designer Series paper Stack. I cut this piece 4" x 5-1/4". The striped piece is from the same designer paper stack - It's My Party and cut 1" x 5-1/4". 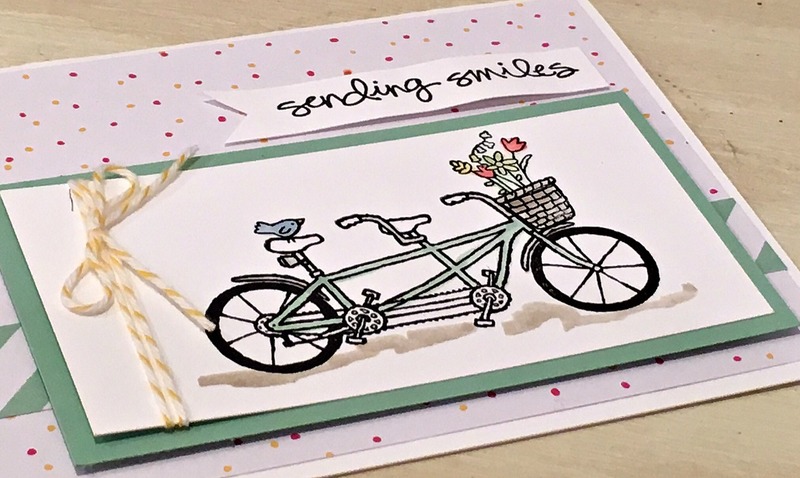 I used Mint Macaron cut 4" x 2-1/2" to layer with the bike on Thick Whisper White cardstock cut 4-1/4" x 2-1/4". 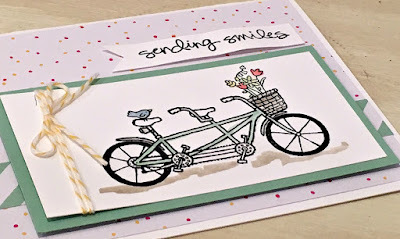 The Sending Smiles sentiment is from Greatest Greetings stamp set. I inked it in Archival Basic Black ink. I find the Thick Whisper White cardstock the best for watercoloring. 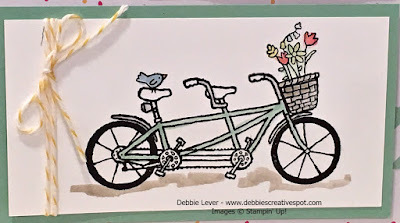 I stamped my images - bike, basket and flowers and little bird all in Basic Black Archival ink. 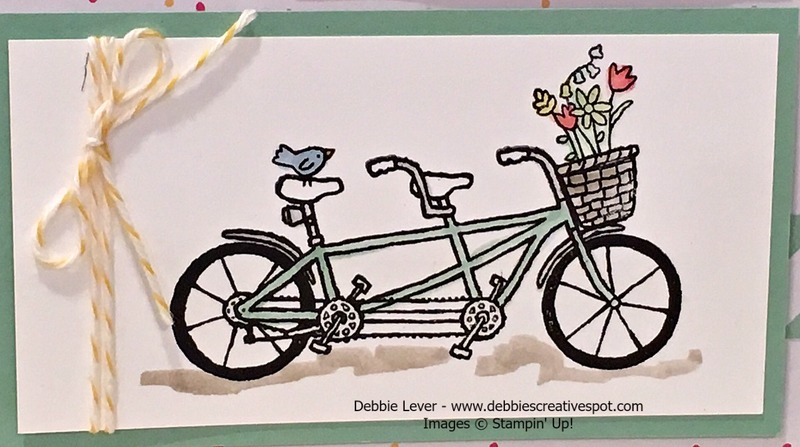 Using my Aqua Painter, I colored the images in Mint Macaron, Marina Mist, Watermelon Wonder, Daffodil Delight and Tip Top Taupe ink pads. Oh, and just a touch of Smoky Slate on the parts I thought should be chrome. Squeeze the ink pad and when you open it there will be a nice ink pallet on the inside cover which is where you pull the ink from with the Aqua Painter. The Crushed Curry Bakers Twine finishes the look which I wrapped around twice and tied a bow! Come back tomorrow and see what I've made with the Metallics Glitter Tape!